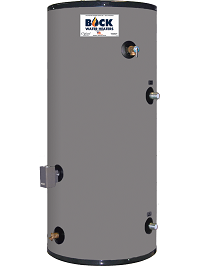 Single-wall full throat 1-1/2” diameter internal coil heat exchanger. 30, 38, 45, 75 and 110 gallon capacities. Factory installed Aquastat on all models. Factory installed T&P Relief Value and Brass Drain Valve. Standard 7 year residential tank and heat exchanger warranty with a FREE upgrade to a limited lifetime warranty. 3 year commercial tank/heat exchanger warranty.